Two words can describe Germany's Mystic Prophecy tenure in metal: indefatigable and predictable. Despite shifting line ups over the years, and now with one more cohesive, the band soldiers on with their seventh release, Ravenlord. Also, their metal remains basically the same, again easily defined in two words, heavy and intense. With a few exceptions, Mystic Prophecy offers another album of galloping heavy power metal with more similarities to speed or thrash metal. This is notable on Die Now, Cross of Lies, Damned Tonight and Reckoning Day. Endless Fire, especially, has a strong thrash feel. But Mystic Prophecy can be simply heavy, steady, and bombastic as on the title track and Winds of Destiny. The band is better when the blend their intensity with more melodic, and catchy, accessibility as on Eyes of the Devil and Hollow, the two exception mentioned earlier and the best songs here. Vocalist R.D. Liapakis is at his most raw, gruff, and grim best throughout. However, as the album moves along his vocals seem muted or understated. Of course, young guitar stud Constantine shreds with skill and fervent abandon throughout, and so may be the single best reason to check out the latest from Mystic Prophecy. 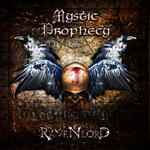 The persistent Mystic Prophecy offers Ravenlord, another blast of galloping, speed and thrash influenced, power metal. So then not much has changed.